Basic home electrical wiring does not have to be an unattainable task. I think that with a little help, a push in the right direction, anyone can tackle any basic home wiring project. 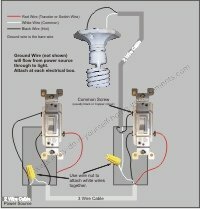 I have put together some basic wiring tips for you. 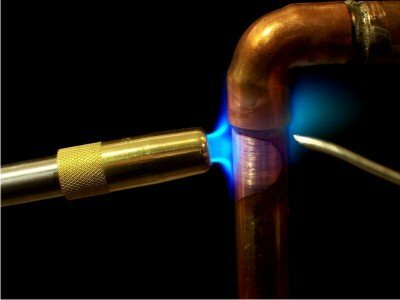 This is a great place to start learning a thing or two about household wiring. Make sure it is dead. 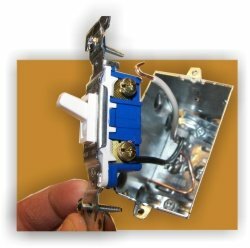 Looking for home electrical wiring a light switch? First of all, always - and I do mean always - TURN OFF THE POWER. In every article I write, you will see me writing those very important four words. You may even get tired of hearing me say that, but that is ok. It needs to be drilled in your head if you are going to do any electrical work. If you are wiring your basement from scratch, this will be easy because generally, the last thing you will do is hook up the wires into the panel. If you are adding a new plug or switch, you can just turn off the breaker in the panel box, test the circuit again and continue working. You don't need to be a hero, take it from me... I have destroyed a pair of side cutters because I thought it would be "faster" not to turn off the power. Never again. When wiring a plug or switch, try to use what I like to call the "quick connect" holes on the back of the receptacle. There is usually a marking on the back that tells you how much to strip off the wire. Then you simply push the electrical wire into the correct hole and, voila, you're done! If you choose to wrap it around the screws on the side, always wrap in a clockwise rotation. This ensures that the wire will not pop off the screw when tightening it because it actually helps pull the wire closer to the screw. When joining wires together in a junction box or "pig tailing" wires, twist with a pair of pliers before putting on a wire nut. Give yourself some room to work with. When pulling new romex wire to your switch or plug, give yourself 6 to 8 inches of extra inside the electrical box so you don't have to be a contortionist to wire it up. You can always cut off a bit but it is a pain to make it longer. Put a broomstick through the hole in your wire spool and rig it up so the wire will pull off nice and straight. If you set the spool on the ground and just pull it up, it comes off all curled and twisted... stay sane, roll it off. Label, label, label. You can get in a real mess if you are running multiple wires and don't label where they go or where they are coming from. The last thing you want to do is re-trace all the wires you just spend 4 hours running so you know what to hook up where. Have the proper tools handy. Any diy home electrical wiring job is easier if you can get the proper tools. You want to do a good home electrical wiring job and I know from experience that if you rush it just to get it done, you won't be happy with the final result. If you are adding a new plug in a wall, take some time to plan. Check to see how you are going to get the wire to that new location. Can you even get a wire there without destroying an entire wall? 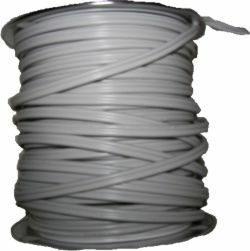 How much wire do you need? Where are you getting the power for this new plug? All of this needs to be taken care of before you cut the hole in the wall. Draw it out. Think of where you would like your lights. What kind of lighting? How many plugs? Where is the TV going? The computer? Depending on your layout, you may want dedicated circuits to different areas of your basement. Load is a term that is used when talking about how much "power" is being used by home electrical wiring. Things like an appliance, computer, TV, etc... Or it can be used to describe how much "power" is being taken from a breaker in your panel box.